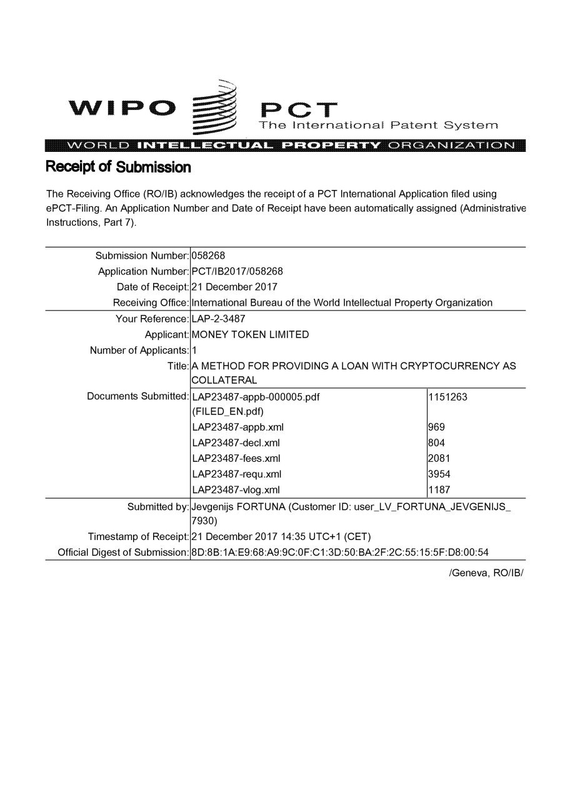 We`re glad to announce that Money Token has filed a new patent application for cryptocurrency backed loans technology to WIPO, the World Intellectual Property Organization. 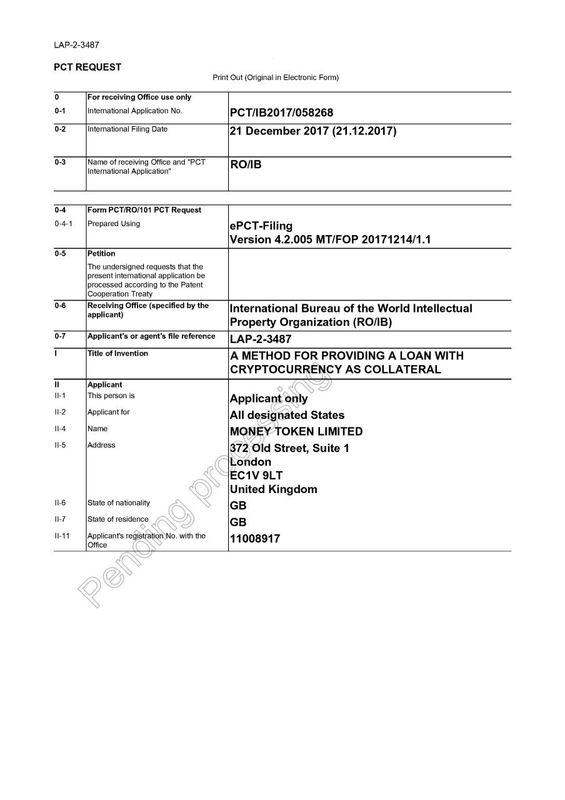 The patent materials will be published on the WIPO website around June/July 2019. We`ll post updates via our social media. Patent application and confirmation from WIPO are attached below. We see a lot of projects out there developing blockchain-backed lending models, and we want to patent this concept to actually protect it. Protect the idea of crypto backed lending from any centralized attempt to monopolize it. “We recognise that there are a number of projects out there in the cryptocurrency and blockchain space that are currently developing blockchain-backed lending models. The MoneyToken’s application to patent this technology isn’t about stifling competition or restricting the freedom to develop similar solutions within the community — far from it — our intention is to protect these concepts and projects from any centralised monopoly. A lot of individuals are currently holding their assets — we want assets to work for their holders, not just from growing demand and increasing mining difficulty, but through the development of the cryptocurrency ecosystem. With MoneyToken’s unique technology solution, crypto holders gain the opportunity to maintain their cryptocurrency asset positions while receiving stable spendable funding in return, enabling them to hold onto their investments. We`ve set the MoneyToken launch to early 2018, with a Token Generation Event appointed to start simultaneously with the platform launch dates. We`ve previously announced the arrival of “Amanda”, our Artificial Intelligence loan assistant, who will provide automated loan services to showcase MoneyToken platform`s functionality in early 2018. Have you checked here out yet? You can find out a lot more about us and the project at our website, moneytoken.com. Feel free to visit the website and download and read our Whitepaper and Abstract pdfs.